Stir the melted butter, powdered sugar, graham cracker/vanilla crumbs, and almond butter together, until all of the ingredients are incorporated. Line a 9 x 13 inch dish with foil. Drape the foil over the sides of the dish so that you can easily remove it once the bars set. Press the mixture into the bottom of the dish. Melt the vegan chocolate in a double boiler and spread the chocolate over the almond butter mixture. While the chocolate is still warm, cut the bars. Allow to set for at least an hour. Spring has sprung and we want to spend more time outdoors then we do indoors. That includes nixing time consuming recipes! 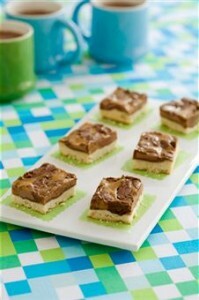 These easy, no bake almond butter and chocolate squares are always a huge hit and take virtually no time to make. 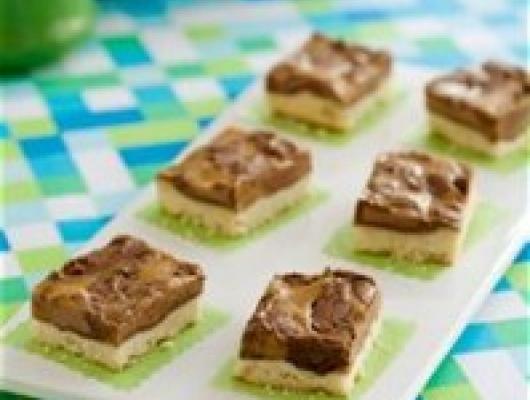 Great for picnics and parties, these decadent little treats, while still sweet, are packed with protein, good fats and antioxidants. Talk about sweet indulgence!